Luis Bush has been a magnificent example of helping to transform the world wherever he has gone. The Yes Effect is packed with stories of humble people who have transformed their cities by saying yes to God’s invitation to change the world around us. Luis Bush is a global visionary who carries the heartbeat ofGod to bring hope and transformational change to the poor, oppressed, and downtrodden of the world through the message of salvation and principles of God's word. I highly encourage you to discover his secrets through reading The Yes Effect. They will work, whether the next step God is asking you to take is big or small. If the immensity of the world’s suffering makes you feel powerless, The Yes Effect is assigned reading. Its stories of real people saying yes to God illustrate the urgent task of loving God by loving God’s world. This book compels us to see those who suffer and to weep with them. It also invites us to pray and to work for the kingdom coming on earth as it is in heaven. We are so thankful for Luis and Doris Bush’s vision and passion—to reach the most needy, lost, and broken people of the world. May these inspiring stories move the hearts of many to say yes to the Lord’s call in their lives and to bring the gospel, wherever God leads, to the ends of the earth. Luis Bush is a leader who embodies the gospel as well as anyone I know. If you are serious about making an impact on this world for the cause of Christ, Luis has always had much to say worth pondering. Listen to him and be moved! I had the privilege of serving as Luis Bush’s pastor in the early 90s. He soon became my mentor, birthing and shaping in me a passion for world missions that changed the trajectory of my ministry. If you know Luis, you know him as a visionary who can coalesce leaders from across the globe like none other. 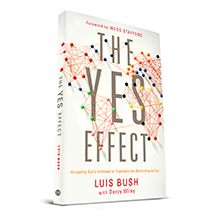 If you don’t know Luis, read The Yes Effect for the compelling stories and contagious passion. You might just put it down to go out and change your world. Almost every dedicated Christian is aware of the “10/40 Window” but few know the origin of this unique focus on a swath of land stretching from southern Europe and North Africa to the Far East. Luis Bush shares the secret of a productive life for Christ: a sincere yes to anything God asks. I have witnessed the “yes effect” in the life of the author from his days as a student at Dallas Theological Seminary to his present amazing leadership in mission outreach all over the world. You will not want to miss reading this life-changing book. Missionary tales were favorites of mine when I was young, but I stopped reading them as I grew up and sensed God calling me to put down roots and serve my neighbors. Reading this astonishing and beautiful testimony of God’s work in the world, I saw with new eyes the value of my own small yes. When we say yes to God, even in small things, our hearts and then our communities can be transformed to an extent we might never have imagined. The Yes Effect revealed my own place in a much larger story of God’s goodness and faithfulness and inspired me to go on, every day, saying yes.